How many digital devices do you have? How much time do you spend on the computer, either for work or for recreation? I imagine I’m pretty much in the mainstream, relying heavily on the computer for most of my work and certainly spending a fair amount of time (although not as much as some people) checking emails, updating my blog, and reading articles on the internet. I already know that the sedentary lifestyle isn’t good for my body, but what effect is all this technology use having on my brain? The resulting distractions can have deadly consequences, as when cellphone-wielding drivers and train engineers cause wrecks. And for millions of people … these urges can inflict nicks and cuts on creativity and deep thought, interrupting work and family life. Accompanying the article are two online interactive tests you can complete, one that measures your focus and the other that measures how quickly you juggle tasks. Curious, I took both. My results are below. The two tests are very interesting and take only four or five minutes apiece. Check them out and let me know how you did. 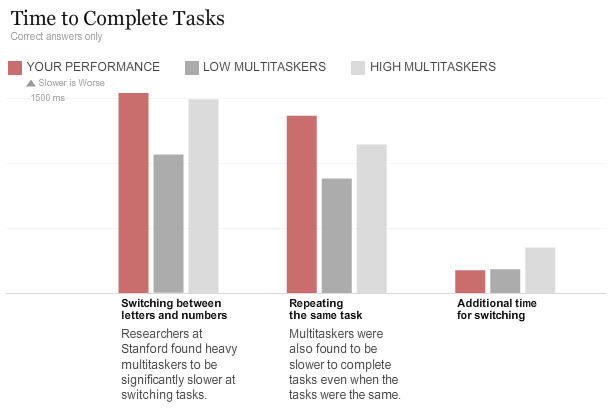 For multitasking, I performed better than both low multitaskers and, to a lesser extent, high multitaskers. As much as I am skeptical whether “multitasking” really exists (sometimes I think it just means to do multiple things without much focus, rather than focusing on multiple things at the same time), it looks like I am a pretty effective multitasker. 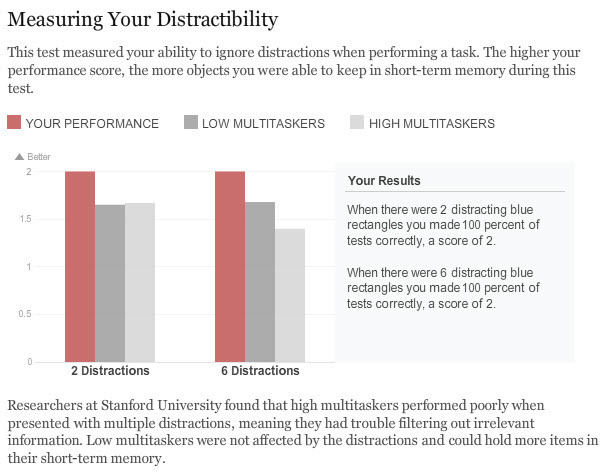 With regards to my ability to focus, I scored better than both low and high multitaskers. Generally, I have a low level of distractibility, as Tawn will attest anytime I’m in the midst of reading Xanga subscriptions and he wants my attention. Seriously, though, as much as I’m a bit of a technology geek and know my way around computers reasonably well, I’m increasingly reaching the saturation point. I haven’t jumped on the smart phone bandwagon, for example, and I’ve been consciously scaling back the time I spend on Facebook and other social media. As for random browsing on the internet, following one link to the next, I’ve but the kibosh on that. Instead, I’ve been reading more books lately, exercising more, and working on a project for my grandparents’ upcoming 90th birthdays. This is my brain, unplugged. What about you? How do you feel about your use of technology? Too much? Not enough? Just about right? This entry was posted in Uncategorized and tagged Brain, Computers, Focus, Multitasking, Psychology, Technology by christao408. Bookmark the permalink. Chris, I think you performed worse than both low multitaskers and high multitaskers on the first test. It says “slower is worse” with the arrow pointed up, meaning that a high number (more time = slower) is worse and you took more time than both low and high multitaskers. Sorry to be the bearer of bad news. :(As for me, I scored with the low multitaskers on both tests. I absolutely CANNOT multitask. For example, when I’m on AIM, that’s the ONLY thing I can do (well… eat, drink, color a drawing, etc. but nothing that requires thought), even if the conversation lasts for hours. I can only have one conversation at a time. If I have more than one, someone inevitably gets neglected. I CANNOT write and listen to music at the same time; the music will put words in my mouth. I have to do my serious writing in absolute silence (no talking, no lawnmowers or construction noise, etc.). I suppose I just have a single-track mind. :<I’m addicted to the Internet in the sense that I waste my time checking e-mail (even though I rarely get one), social networking sites (even though nothing ever happens on my pages), Wikipedia, Googling stuff on a whim, and online news, but for better or worse, I don’t multitask. I don’t use Internet or text messaging on my phone and I don’t have any gizmos other than a laptop. My results were surprisingly close to yours. Not exactly the same, but similar conclusions can be drawn as the shapes are similar. It is quite fascinating… but I guess not unexpected. I’m good at not being distracted, but I do tend to spend lots of time when multitasking…. more than most people, especially if I decide to switch between tasks.I think I’ll be unplugging a bit myself too! I have to multitask at work and I know I’m not that good at it. Gee.. I even forgot the instructions halfway through the tests. @Senlin – Oy… now I’m just very confused. The first test was about the ability to multitask effectively, right? So how come the people rated as high multitaskers did so poorly? Or does that just mean people who are multitasking, not necessarily those who are good at multitasking. I’m just going to go back to reading a book… much less complicated. @ElusiveWords – Yeah, I’m much more of a focus person. Most of what I do involves the creation of training materials, both printed training guides and online programs. I find that if I have any sort of distractions going on, especially IM, I can’t get my work done because it requires that I really get into the topic at hand. In fact, I find that unless I can work on a particular program or materials for several days in a row, my work will suffer. @AzureRecollections – Thanks for the recommendation. I hope more people will take this test and share their reasults as I’m quite curious about them. I suspect the underlying message is that multitasking isn’t such a great thing. My understanding is that the first test tests your ability to switch between two tasks: determining whether a number is odd or even, and determining whether a letter is a vowel or a consonant. I don’t think it’s a test of multitasking per se because it’s only asking you to do one or the other at a time; the trick is switching quickly between them. Hence the column on the right in that first graphic you pasted (“Additional time for switching”) is the difference between the heights of the bar for “Switching between letters and numbers” and the bar for “Repeating the same task”; the rightmost column is measuring the additional time it takes to switch between the two tasks. The article says that multitaskers did worse at this test (took longer to switch, and took longer on each individual task), suggesting that multitasking rewires the brain to become more easily distracted / worse at focused tasks. Sorry for the confusion! Chris, neither of the tests test you to see if you are a “good multitasker” or not. The people in the study were divided into two groups — low and high multitaskers — based on a pre-test. Then they took the two tests and the results show how each group did.So, unless you take the pre-test that tells if you are a low or high multitasker (which was not included) then it seems to me that these results are mostly meaningless… except maybe in the first test it would seem like you have more in common with the “high multitasker” group and in the second test you have more in common with the “low multitasker” group. In other words…. NOTHING. :)I think this article has some interesting anecdotes, but it takes studies of people’s natural tendencies to be multitaskers or not, and tries to extend that to say that the modern digital lifestyle is making people do worse at tests like these. But none of the studies actually say that. They say that some people are naturally distracted by new information and some people aren’t. They studies don’t say that our brains are changing, they just say that some people might be more distracted than others and some can multitask better than others. That’s all. oh just reading this interesting while waiting at the lounge for my flight back home……will try it out once I’m at home……. @brooklyn2028 – Is there such an app? Good call, man. Like a typical college student, I find myself procrastinating on the net; usually YouTube or Facebook. But really, I should have be working on my paper that’s due the next day. I didn’t take the tests, but I know that I am a very focussed person, and really a good multitasker too. I think each individual, given a time and place and the kind of operational test, will do ok, at least for his/ her level. I’m probably a little too engaged with my gadgets although I have yet to cave to a smart phone and I don’t go crazy if I don’t have email access. @TheCheshireGrins – There’s still a chance for you, then! Run! Save yourself from the technology! =D@Chatamanda – That’s an interesting point. I didn’t consider it, but it would make sense that time of day could affect performance. @christao408 – No there isn’t but if there was, I’m be in trouble! Good informative article. I need to come back to this one and think more ‘deeply’! About the Internet, at least I would have to say, heavy user. I’m about to start work so yes, I’m going to be cutting down on Facebook and other stuff. Some things are simply not worth the time and energy they require… And yes, I need to start exercise more!!! @arrian_strider – Another Xangan set up his work desk to a treadmill (treadmill work station) so he can walk at about 1 mph all day long. Sounds like a good idea to me as a way to incorporate moderate exercise into the daily work routine.